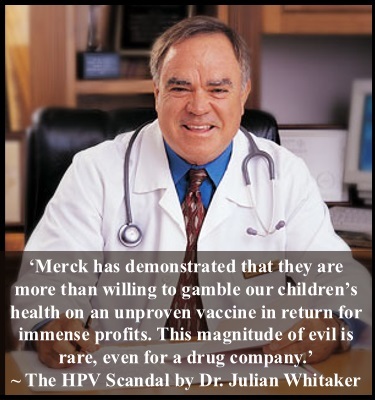 [2012 March] Gardasil (HPV Vaccine): Fraud in Plain Sight by Dr. Whitaker MD Of all the dangerous nonsense perpetuated by Big Pharma and its savage attack dogs infederal and state government, the human papillomavirus (HPV) vaccine is surely the most fraudulent and wasteful. [2010 Aug] Modern medicine's biggest lie claims lives by JULIAN WHITAKER, MD Angioplasty, bypass and other invasive heart procedures do not and cannot prevent heart attacks or prolong lives in the vast majority of patients who have them. Heart Surgery Does More Harm Than Good by Julian Whitaker, M.D. SSRI antidepressants work no better than placebo, and their benefits do not meet the criteria for clinical significance.....In addition to being ineffective, SSRIs are dangerous. They cause sexual dysfunction, weight gain, emotional apathy, headaches, insomnia, and gastrointestinal (GI) upset, and they have been linked with GI and uterine bleeding. But their most alarming side effect is an increased risk of suicide, hostility, akathisia (extreme agitation), and violent behavior. ....Last year, I met Mathy Downing, the mother of Candace Downing, a beautiful, exuberant 12-year-old honor student who had been put on Zoloft for "generalized anxiety disorder." A few months later, Mathy found her daughter dead, hanging above her bed. Just an hour before, she'd been watching Animal Planet on TV with her father. Without exception, all the oncologists I talked to about Dr Burzynski were scornful and hostile. Twenty- five years of practicing unconventional medicine did not prepare me for what I discovered. Delving into attitudes, actions, and beliefs of modern oncologists was like opening a box of cereal and finding it full of worms. They just don’t care….The question I kept asking was why, and the answer to that question gradually began to creep out: Dr Burzynskis discovery threatens one of the largest and most lucrative industries in the history of mankind, the cancer treatment industry. ..Therefore, each patient who is miraculously cured by Burzynskis nontoxic therapy is not viewed as a breakthrough, or even as something good, but rather as a dangerous messenger of heresy, a terrible threat to their beliefs. "Dr Whitaker, M.D. "Bypass surgery, angioplasty, and even diagnostic angiograms are so over used that, in my opinion, it constitutes criminal behaviour by the cardiologists and surgeons involved. Well controlled scientific studies have shown bypass surgery simply doesn't work, except to relieve severe chest pain. Those who have the surgery didn't even have a trend of longevity benefit compared to those treated without it. Yet, each year hundreds of thousands cave into the obvious fear tactics used by agressive heart doctors and submit to the bypass operation"---Julian Whitaker, M.D. up to 5% may sustain long-lasting or permanent cerebral damage." ---Julian Whitaker, M.D. ..We continue to use them not because they work, but because those who perform them have so vigorously eliminated any other choice. First, I would not even check in with a conventional oncologist, particulary not one from a prominent cancer institution. Their expertise is in implementing the erroneous paradigm that cancer must be purged from the body with toxic methods. This is, in my opinion, no more valuable than maps from the Flat Earth Society. When there is a paradigm shift---and we definitely are in the middle of one with cancer treatment---those sitting on the lofty perches of authority are the last to make the change, because they are guarding the paradigm about to be replaced. I dont buy maps of a flat earth, and I wouldnt go to the NCI or Memorial Sloan-Kettering Centre for cancer treatment. Id turn my back on 50 years of institutionalised expertise, because it follows the wrong paradigm. Everything that is done in medicine today or in any other discipline fits some paradigm. The paradigm I use for cancer is that it is a systemic problem in which the normal control mechanisms of your body are altered. Your immune system likely bears the largest burden for this control; thus, all techniques that enhance it are promising. Those that damage it are not." ---JULIAN WHITAKER, M.D. We know that conventional therapy doesnt workif it did you would not fear cancer any more than you fear pneumonia. It is the utter lack of certainty as to the outcome of conventional treatment that virtually screams for more freedom of choice in the area of cancer therapy. Yet most so-called alternative therapies regardless of potential or proven benefit, are outlawed, which forces patients to submit to the failures we know dont work, because there is no other choice. Id turn my back on 50 years of institutionalised expertise, because it follows the wrong paradigm. Everything that is done in medicine today or in any other discipline fits some paradigm. The paradigm I use for cancer is that it is a systemic problem in which the normal control mechanisms of your body are altered. Your immune system likely bears the largest burden for this control; thus, all techniques that enhance it are promising. Those that damage it are not. "Conventional Medicine is locked into a dogma that believes that its way is the only way. Conventional doctors deny you have any alternatives to their drugs and surgeries. But you do have choices. And these enlightened treatments are far superior to the risky methods of modern medicine. . .which can be extremely dangerous to your well-being. . . . This enlightened new approach to health will lead contemporary medicine out of the Dark Ages of drugs and surgery, because it does work better. I know, because I use these alternative therapies every day in my medical practice. . . .Many of the patients I see are 'medical refugees' who have been abused and abandoned by conventional medicine. . . .The results we see are truly impressive, more so than with any drugs and conventional treatments they gave us in medical school. . . .The 'drugs or surgery only' approach that modern medicine uses to treat today's diseases is archaic. "Julian Whitaker, M.D. "Bypass surgery, angioplasty,and even diagnostic angiograms are so over used that, in my opinion, it constitutes criminal behaviour by the cardiologists and surgeons involved. Well controlled scientific studies have shown bypass surgery simply doesn't work, except to relieve severe chest pain. Those who have the surgery didn't even have a trend of longevity benefit compared to those treated without it. Yet, each year hundreds of thousands cave into the obvious fear tactics used by agressive heart doctors and submit to the bypass operation"---Julian Whitaker, M.D. 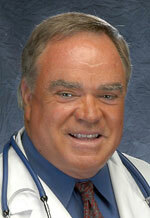 Dr. J. Whitaker M.D. - "Ritalin: Legally Sanctioned "Speed" Ritalin is the number one prescription drug for children with attention deficit hyperactivity disorder (ADHD). This drug has such tremendous potential for abuse that it is classified as a controlled substance by the Drug Enforcement Agency. Ritalin is an amphetamine (in street jargon, "speed") with a lengthy list of side effects, including nervousness, insomnia, nausea, abdominal pain, loss of appetite, dizziness, palpitations, headaches, irregular heart rhythms, and psychic dependence — in short, addiction. In fact, Ritalin's appeal to drug users and its potential for abuse are so high that US House Judiciary Chair Henry Hyde (R-IL) recently filed a request with the General Accounting Office (GAO) to conduct an investigation of Ritalin abuse in public schools. In addition, class action lawsuits have been filed in Texas, California and New Jersey charging Swiss pharmaceutical giant Novartis, maker of Ritalin, with conspiracy to create the psychiatric disorder known as ADHD in order to fuel the market for their product."